Enjoy long range mountain views from each level of this town home. This perfect mountain retreat is what you come to the mountains for. Beautiful mountain vistas that are simply therapeutic for the soul. 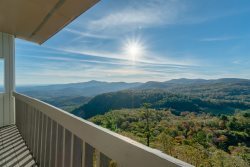 Updated, newly re-furnished mountain top vacation rental, 3 bedroom, 2 bath condo located at VZ Top, in Highlands, NC, where the summer temperatures rarely break 80 degrees and one never gets tired of the expansive mountain views. The unit includes 4 balconies, one off each bedroom and one off the dining room. On the main level is the large living room which has a 12 foot high ceiling and laminate wood floors. One wall has two large windows stretching 16 feet across. There are two chairs facing them with a panoramic view of the scenic mountains. The second wall has a wood burning fireplace perfect for snuggling on the sectional sofa. Although guests don’t come here to watch TV, there is a 65” flat screen 4k Ultra HD TV. Cable as well as Netflix HD is included. (Netflix is available on all TVs). Adjacent to the living room is the dining room where the large table comfortably seats six people. Barstool seating at the kitchen counter can accommodate four more guests in the same room. There is a sliding glass door off the dining room to the balcony where the high top table and stools seat four more people. The kitchen is fully equipped including a new quiet dishwasher, smooth top stove, microwave and all the pots and pans you will need. But, because this is a vacation rental, please check out all the fabulous restaurants in town too. Wild Thyme is a favorite, and who can resist ice cream at Kilwins? Upstairs is the master suite with a King size canopy bed and luxury linens. There is a 58” flat screen wall mounted TV. Right now, the bathroom has not been remodeled (a project for this fall), but is clean, freshly painted with new rugs, towels and shower curtain. The master bedroom has a balcony as well. It is the perfect place to sit, drink a glass of wine, and watch the sunset over the mountains. On the lower level are the two other bedrooms, both with luxury linens. The first one has a King bed and a 43 inch flat screen wall mounted TV. The second bedroom has a Queen bed and a 40 inch flat screen wall mounted TV. Each room has its own private balcony with two chairs and a table to enjoy the wonderful fresh air. The nights are wonderfully cool and sleeping with the sliding doors open is quite pleasant. The lower level has a full size bathroom that was remodeled a few years ago. There is also the washer and dryer on this floor. The home does have central heat and air if you need it. This condo is a three story home with no neighbors above or below. A Pet Friendly vacation rental, Dogs are welcome, (pre-approval needed), but, please no cats. There is parking in front of the unit for two small to medium size cars. Additional parking is available, but away from unit. Main Street Highlands NC is just a short less than 10 minute drive down the mountain. There are lots of fine boutiques shopping stores to shop in and plenty of fine restaurants like Wild Thyme or Wolfgangs and several more to try. Be sure to stop by the Old Edwards Inn and Spa for a relaxing spa treatment or dinner. Close by are many hiking trails, lakes, and waterfalls.